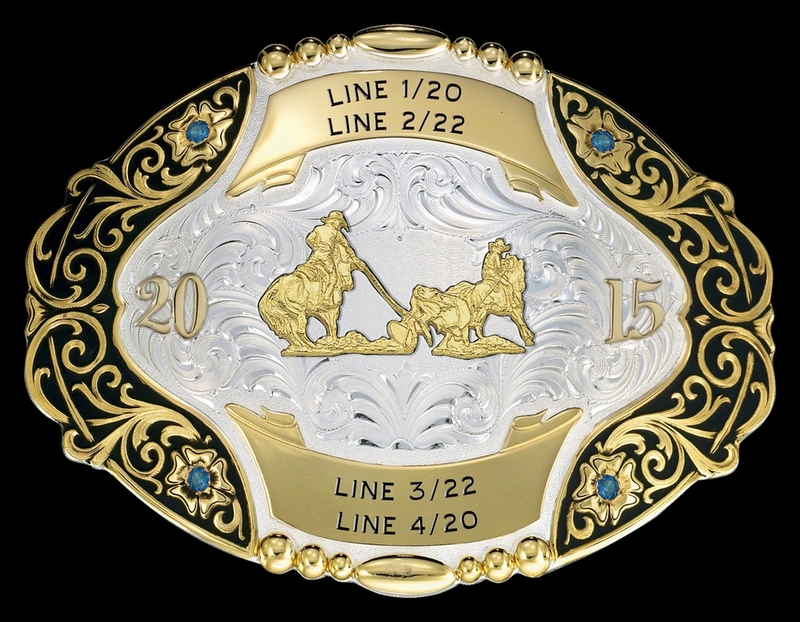 Trophy Buckle 60255 from Montana Silversmiths. At 3 7/8" x 5 3/8", this is as big as they get. Click image to enlarge. Displays up to four lines of engraving in the color of your choice. Includes date trim (optional), four stones (shown here with sapphires) and your choice of background colors (shown here in Midnight Black). Enter your engraving and other options in the form below, then click >>Calculate Cost<<. Shown with team ropers figure 857. Features the rugged, tarnish-free MontanaArmor finish. This trophy buckle is also available in solid sterling silver (usually price x 3); contact us for a quote.